Product categories of Herringbone Ridge Cap Forming Machine, we are specialized manufacturers from China, Valley Ridge Cap Roll Forming Machine, V Type Ridge Cap Making Machine suppliers/factory, wholesale high-quality products of Herringbone Ridge Cap Forming Machine R & D and manufacturing, we have the perfect after-sales service and technical support. Look forward to your cooperation! Herringbone Ridge Cap Forming Machine is also a kind of ridge cap forming machine. It is a common ridge cap machine. And the machine can be with punching according to customers` requirement. It works better with the matching roof tiles, more stable and better protection. 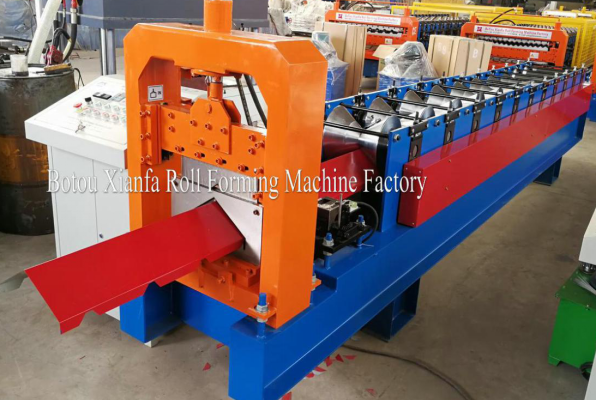 Good quality and best price, top steel ridge tile forming machine, we look forward to cooperation with you.